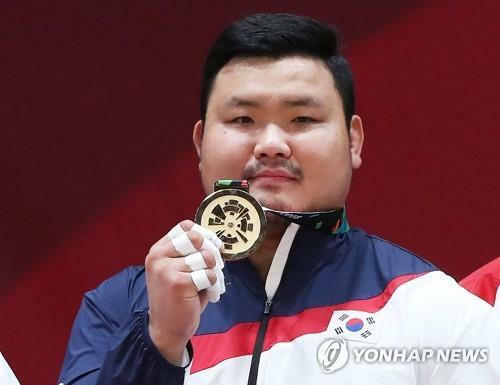 JAKARTA, Aug. 31 (Yonhap) — With an injured arm, South Korean judoka Kim Sung-min said Friday he fought with a do-or-die mantra in the men’s over-100 kilogram division final at the 18th Asian Games. Kim beat Duurenbayar Ulziibayar of Mongolia in the final at Jakarta Convention Center Plenary Hall in Jakarta to take his first Asiad individual gold. He had already grabbed gold in the team event at the 2014 Incheon Asian Games, but settled for bronze in the men’s over-100kg. On his way to the final, Kim edged out the defending champion Takeshi Ojitani of Japan on “hansoku-make,” or foul-play loss, in the semifinal. Hesustained an injury in his right arm, however, following an unapproved move by Ojitani that was ruled foul. In the final, Kim faced Ulziibayar, who defeated him in the semifinals at the 2014 Incheon Asian Games. Against Ulziibayar, Kim earned waza-ari with a hip throw and sealed the gold. Kim, 31, serves as captain in the national judo team. He said South Korean judokas fought hard for the Asian Games, allowing them to wash away the disappointing results at the 2016 Rio de Janeiro Olympics. South Korea got no gold medals at Rio 2016 and only won two silvers and one bronze. Kim finished ninth in his event. At Jakarta-Palembang 2018, South Korea so far has four gold, six silver and one bronze medal. Kim, a veteran who also finished fifth at London 2012, said he will keep moving on for a medal at the 2020 Tokyo Olympics.